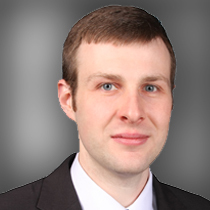 Paul Brandt is a Senior Chemical Engineer at Burns & McDonnell Engineering Company in Kansas City, Missouri. He works on projects within the Energy sector, with a specific emphasis in air pollution regulations, water/wastewater regulations, and associated control technologies. His experience includes the design, construction, and start-up phases of major retrofit work at various power plants. This work has included design and installation of: selective catalytic reduction reactors for removal of nitrous oxides from boiler flue gas, lime and limestone flue gas desulfurization scrubbers, pulse jet fabric filters, reverse osmosis water treatment systems, and chemical dosing systems for water treatment. He has experience in managing EPC and Owner’s Engineer contracts, as well as developing regulatory and optimization studies for clients in Missouri, Kansas, Florida, Texas, Delaware, Iowa, Minnesota, Oklahoma, Louisiana, and Kentucky. He is licensed as a professional engineer in the State of Missouri. Paul and his wife Anne both grew up in Nebraska and now reside in Overland Park, KS with their daughter, Gianna, and son, Oliver.